WHAT’S IN THE SOLO HOME GEL MANICURE KIT? 4 colours – Chicks Dig Firefighters, Pinkie Swear, 3s A Crowd, Truth Or Dare. Double Ended Cuticle Pushie tool and removal tool. Ensure hands are freshly washed and dried. 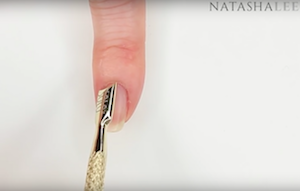 Shape your nail using a 240 grit nail file. Very gently push back cuticles with the Cuticle Pushie tool. Instructions with the kit advise to buff the surface of the nail with the buffing block but I never do this. Ideally always try to avoid buffing the surface of your nails. Cleanse the nails with the Nail Prep Wipes paying special attention to the sides and end of the nail and under the free edge (the white bit of your nail). Apply a coat of Solo One-Step Gel carefully avoiding the skin around the nail and ideally leaving a gap between the polish and the skin of about 1mm. This will give a professional look to your nails and help them to last longer. Cure 4 fingers in your Solo LED lamp for 60 seconds. It will switch off automatically after 60 seconds. The thumb will require curing separately. Repeat stages 5 & 6. Finished!!! It’s as easy as that, no base coat, no top coat and no sticky layer to be removed.